As if caught in a time warp, Topsail resembles resorts of decades past. It has the small-town feel of a family beach, a place with few commercial trappings whose devotees return generation after generation. McAllister blends interviews with the people who know the island with stories of early pirates, devastating hurricanes, a 1940s dig in search of a 1630 Spanish galleon's treasure, the US government's secret rocket program, a modern-day sea-turtle preservation project, and a black bear that came to stroll the beach. 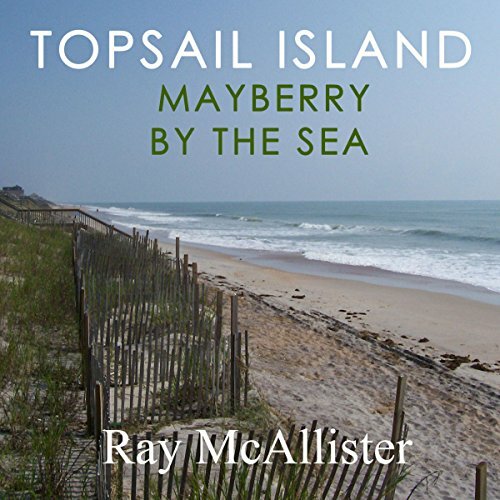 McAllister tells the many stories of Topsail with the help of those who love the island best. If nothing else, you will walk away with that. The narrator did a wonderful job. His accent is southern without being slow. It has the feel of an older relative telling a story, which I really appreciate. I'm sure there will be people that disagree with me, but if you're looking for a book about an extremely interesting place- this isn't it. I feel like an editor could cut out so much information (and add an index) and quite possibly give the book potential. I will let a sampling of the story speak for itself below my review. I think this book would be perfect for someone who lives on Topsail or has had occasion to visit the island to notice some of the island's peculiarities and know some of the population. If someone I knew was going to visit there, I'd probably recommend that they listen to this. I received a copy of this book for free from the author, narrator or publisher in exchange for an unbiased review. It is 6:40 on an October morning. Sunrise is approaching. the waves crash on the beach, louder, it seems, than during daylight hours. The air is cooler, damper, the breeze seemingly stiffer. Later in the day, shirts and shorts will be fine. But for now, this is jacket weather. The only light comes from the Surf City Pier, stretching out over the Atlantic. Lights atop poles send small, dim glows into the mist. The lighting is enough only to suggest shapes. There seem to be people on the pier already. A red-yellow glow appears across the horizon, muted at first, then more commanding. It is a scene of serenity: waves rolling onto the beach, a pier extending into the mist, the awakening sun illuminating it with more artistry than a lighting-effects expert ever could. The first rays of the day also bring the shapes out of hiding. Dozens of people, perhaps scores, are on the pier. Their faces are still unclear. But their fishing poles extend upward against the railing. A thin line trips from each into the surf. Some have been here for hours already. Some will be here all day. There are few better places than a fishing pier. Commercial and individual fisherman mined the waters of Topsail from boats or the beach except when the military controlled the island in the 1930s and 1940s. Fishing resumed after the military left in 1948 and was made easier by the pontoon bridge it left behind. Most of the early postwar fishermen were content to stand on the beach and cast their lines into the surf or drop them from boats into the sound or ocean. But they were happier when the piers showed up. There have been as many as nine piers on Topsail at one time-eight on the ocean and one on Topsail Sound. Piers come and go on Topsail, battered by storms, rebuilt, given new names, let go. Even the start-up dates have been debated. An article in the June 1967 issue of The State magazine said Topsail had the largest concentration of fishing piers on the North Carolina coast, including the Surf City Pier (built in 1952; actually in 1953), New Topsail Ocean Pier (1953; actually 1954), Barnacle Bill's Pier (1956), Paradise Pier (1958), Dolphin Pier (1960), McKee's New River Inlet Pier (1960), and Scotch Bonnet Pier (1967). The black-owned Ocean City Pier, not mentioned, opened in 1959. This was a wonderful story about a secluded special place.We are given a tour of Topsail Island by a man that has spent time there and other places,Topsail is his favorite.Told wonderfully by John Witt,we fall in love with a place that reminds us of old times in a beach town,the people who people it and the possible future that we can not control. "I was provided this audiobook at no charge by the author, publisher and/or narrator in exchange for an unbiased review via AudiobookBlast or MalarHouse dot com"
If you could sum up Topsail Island in three words, what would they be? What was one of the most memorable moments of Topsail Island? The downhome folksiness that permeates the story. Have you listened to any of John Witt’s other performances before? How does this one compare? I would have enjoyed that, but time (6 + hours) prevented that. I enjoyed this story and want to take the family to Topsail Island for our annual vacation next year.